Abstract: Calc–alkaline lamprophyres are known from several localities in the Malá Fatra Mountains. They form dykes (0.5–3 m) of varying degree of alteration that have intruded the surrounding granitoid rocks which are often incorporated xenoliths. Clinopyroxenes (diopside to augite), amphiboles (kaersutitic), biotites (annite) and plagioclases are major primary minerals of the dykes, accessory minerals include apatite, ilmenite, rutile, pyrite, chalcopyrite, and pyrrhotite. Apatite has a relatively low F, but increased Cl content compared to typical apatite from lamprophyres or magmatic apatite from granitic rocks in the Western Carpathians. The chemical composition of the lamprophyres indicates their calc–alkaline character, but affinity to alkaline lamprophyres is suggested by the Ti enrichment in clinopyroxene, amphibole and biotite. According to modal classification of the minerals, the studied rocks correspond to spessartite. The differences in the chemical composition of the rocks (including Sr and Nd isotopes) probably result from the contami­nation of primary magma by crustal material during magma ascent. The age of the lamprophyres, based on U/Pb dating in apatite, is 263.4 ± 2.6 Ma. 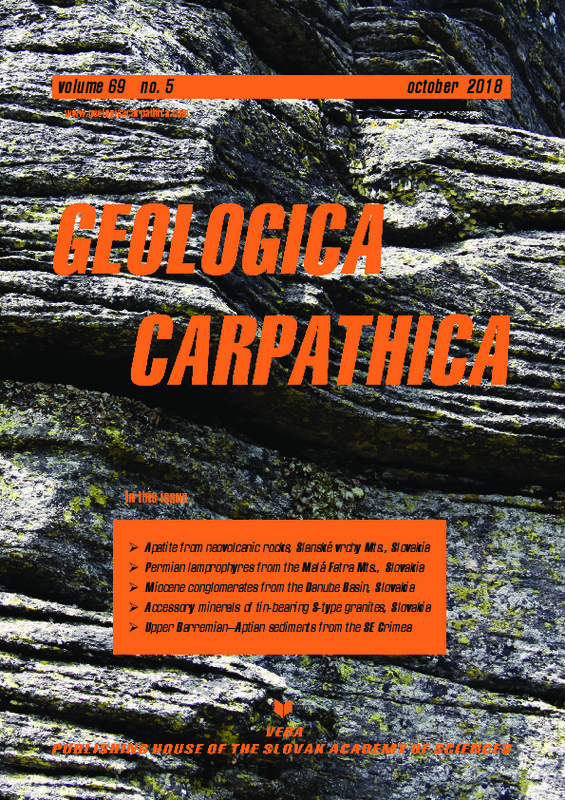 Keywords: calc–alkaline lamprophyres, mineralogy, geochemistry, Malá Fatra Mts.